Recommended Name: � the Bourgeois Tarot. This pattern was originally classified as FT-3. Sometimes known as the "Domestic Scenes" Tarot, but the trumps also depict outdoor scenes and preoccupations of the well to do bourgeoisie. It is therefore recommended that this pattern should be named the "Bourgeois Tarot". It first appeared in the mid-19th century, possibly introduced by the firm of C.L. Wüst of Frankfurt a/M. In early examples on Trump 13, showing a scene in a shop, the price "9 Kreuzer" is clearly written, suggesting a distribution in south and south-west Germany. Its emergence seems to have coincided with the growth of popularity of 54-card games played with a shortened form of one of the Animal Tarot packs, the pattern under discussion fulfilling the still existent need for 78-card packs, not only in parts of Germany but also, a little later, in Switzerland and France. In Germany, ultimately, this pattern, too, was shortened to have 54 cards but in France and Switzerland the games requiring 78 cards survived. The subjects on the trumps have remained almost wholly constant although the treatment by different makers varies enormously (see illustration of the three Trump 8s which show three artists impressions of a musical evening.) Beginning in the 19th century with the fine steel-engraving in heavy Gothic style the pattern is now, regrettably, all too often found with vapid, plastic-looking illustration. Germany retained the practice of placing the numbers (arabic) in the centre of a panel at each end of the card (court cards and trumps are invariably double-ended). French makers shifted the number to the left end of the panel and placed their initials at the right. The Swiss firm of Müller put the number at the left but left the right edge unadorned. A variant of the pattern was made by F.X. Schmid of Munich who retained the traditional format and court figures but illustrated the scenes from a less wealthy, more rural class. Another, by Ferd. Piatnik & Söhne of Vienna, followed the German tradition and format and incoporated many of the standard scenes but in a different order. Usually 78 cards. 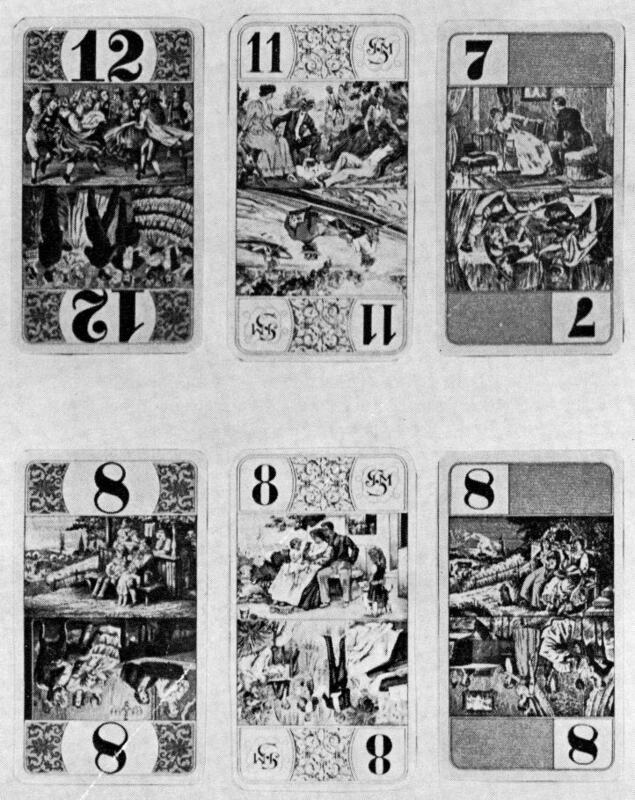 4 suits of 4 double-ended court cards and 10 pip cards, plus 21 horizontally divided double-ended trumps with different scenes at each end and bearing arabic numerals, plus the Fool. In 54-card packs the ace-6 of black suits and the 5-10 of red suits are omitted. C.L. Wüst, Frankfurt (l9th century). V.A.S.S. first in Altenburg (20th century). La Ducale (J.M, Simon), Nancy (1960s). B.P. Grimaud, Paris (this pattern, 20th century). J. Müller & Cie., Schaffhausen (20th century). 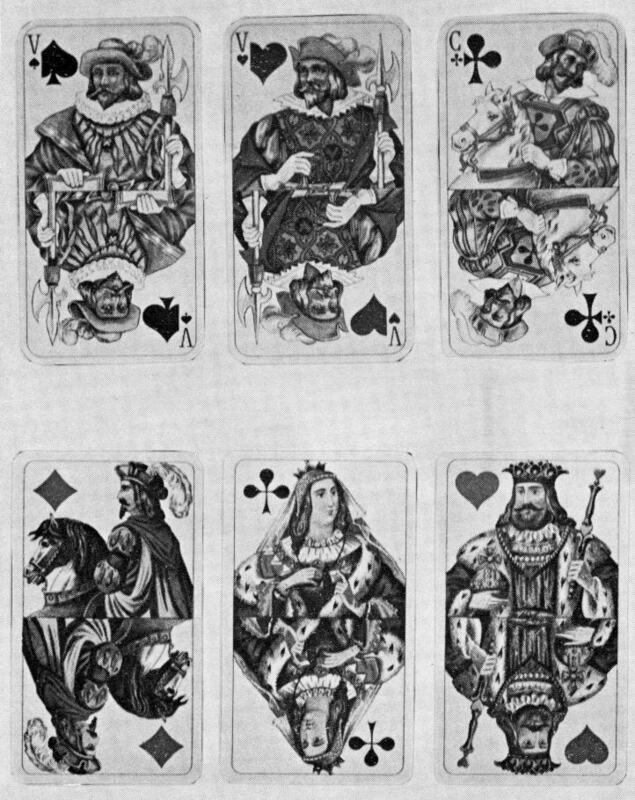 Cards from packs by V.A.S.S., La Ducale and J. Müller.